If accountants and CPAs are the seeing-eye dogs and guard dogs of the financial world, forensic accountants are the bloodhounds. Forensic accounting is a specialty practice area that combines the investigative skills unique to law enforcement with the analytic skills unique to accounting. Forensic accountants look beyond the numbers and deal with the reality of a given situation. So when do you need to add one to your family law team? As a divorce attorney, you deal with your clients’ financial documents on an almost daily basis. You must determine the full extent of each couple’s financial situation in order to help your client arrive at an equitable property settlement. 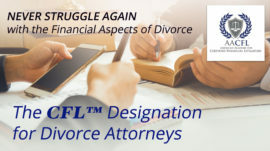 When your client and his or her spouse have an extremely complex financial situation, however, you may not feel comfortable, even with your CFL Designation for Divorce Practitioners, delving into the intricacies of their financial dealings, especially if your client suspects that his or her spouse is hiding assets. You also may not have the available time to do so. This is when hiring a forensic accountant can assure the success of your case. While many CPAs claim to be forensic accountants, few actually are. Most CPAs lack the highly specialized training and skill required to be true forensic accountants. You may be surprised to learn that the CPA exam does not include any questions regarding forensic accounting. Therefore you need to do a little bloodhound work of your own when determining who to hire. Your entire divorce case may hinge on your decision and your choice. Check into your candidate’s academic education. Does (s)he have an undergraduate and master’s degree in accounting with an emphasis in business, law and fraud accounting? Does (s)he have additional advanced training and/or certification in law enforcement and/or criminal justice that qualifies him or her to perform forensic accounting litigation support? In addition, check into your candidate’s actual professional practice. How long has (s)he been licensed and in practice? What types of cases has (s)he handled? Does forensic accounting make up a substantial portion of his or her practice or is it something (s)he does on an infrequent as-needed basis? Never forget that you are the quarterback of the team. This is your case and you bear ultimate responsibility for its success or failure. Your client, too, is an important team member since (s)he knows his or her spouse’s habits better than anyone else. (S)he can steer the forensic accountant in the right directions to make it easier to find hidden safe deposit boxes, bank accounts, cryptocurrencies, etc. (S)he also can suggest who else the forensic account should investigate as likely “co-conspirators,” such as the spouse’s family members, employees, and/or a possible paramour. 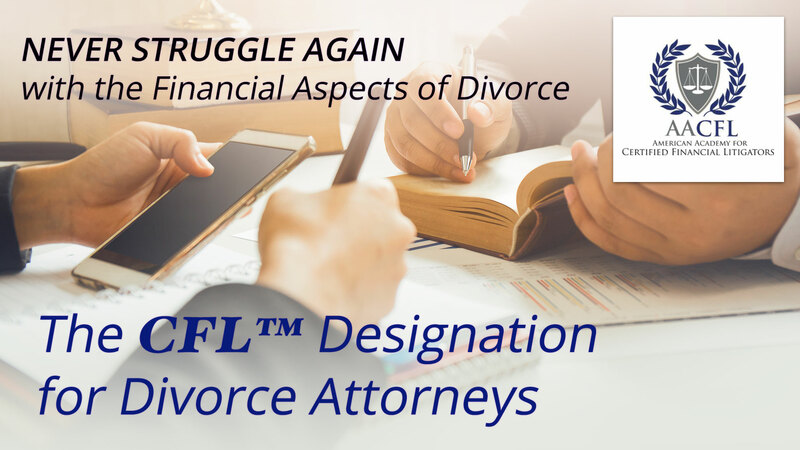 For more information on additional financial issues you need to be aware of, how gaining your CFL Designation for Divorce Practitioners will give you the financial knowledge and skills you need to attract additional high-asset clients, and the other benefits of AACFL membership, please visit this page on our site.